Emirates First Class Suite Review – What’s it like to Fly Emirates First Class? Ever since I was a kid, I’ve wanted to fly First Class with Emirates and with a little help from some air miles I had earned using the American Express Gold Card, I finally accomplished this dream last month. 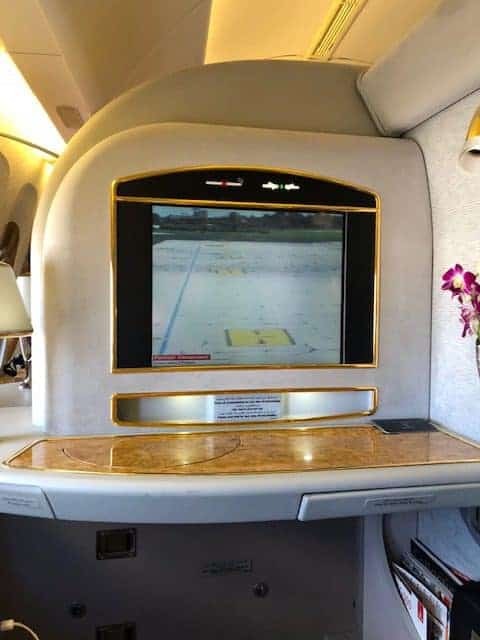 What’s even better is that this Emirates First Class Flight was practically free. Within this Emirates Airlines First Class review I’m not only going to be covering a full review of the complete Emirates Airlines First Class experience but also provide you with the tools to be able to fly in your own private suite for less than the price of an economy ticket! 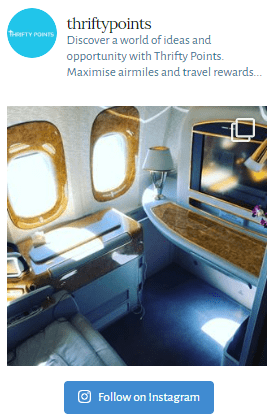 IFE System – What’s Included in the First Class Emirates Price? 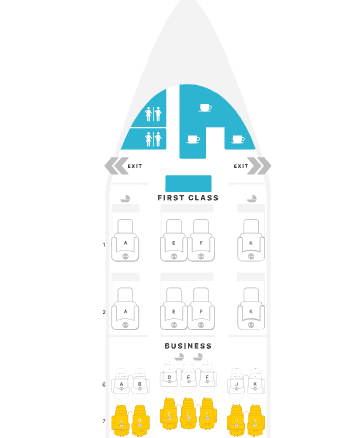 Let’s face it, flying First Class is nearly always an expensive affair and that’s something that doesn’t sit quite right with me (the author of a blog with thrifty in the title!). So how could I justify the full Emirates First Class price? Well as regular readers will know, I’m a keen collector of all things points, especially American Express Rewards points. Now these points can be transferred to numerous airline reward schemes including Emirates Skywards. What’s even better is that I earned enough points in 3 months through the wonders of a credit card sign-up bonus currently being offered by American Express that I was able to redeem this flight for £167 and 30,000 reward points. 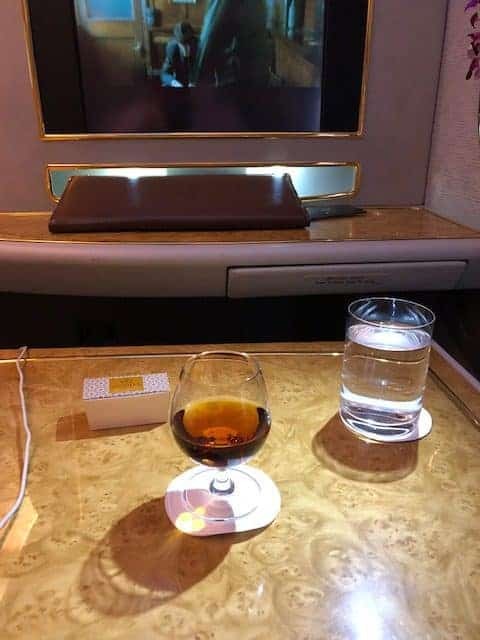 I would highlight that 30,000 rewards points are the smallest amount you need to fly Emirates First Class (read on to find out more). 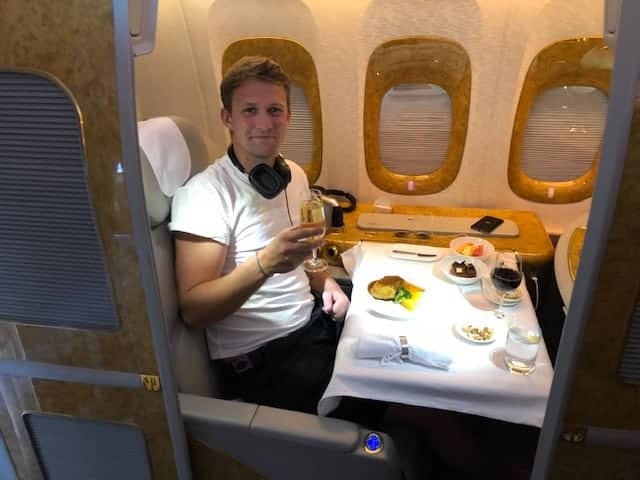 I thought it would be helpful to quickly explain how my other half and I managed to accumulate 30,000 points per person to redeem this incredible Emirates First Class flight experience. American Express Gold Card: See my full review here. The card offers a sign-up bonus of 20,000 points (22,000 using this specific link) when you spend £2,000 in the first 3 months. You can then transfer these points to Emirates at a rate of 1:1. The card is free for the first year (I’d recommend cancelling before the year is up!) and includes several other perks like 2 free lounge passes and a further 1 point for every pound spent on the card. By following the step-by-step process below, you can see that it’s actually not difficult to collect enough points to redeem a ticket for a First Class Emirates Suite! Step One: Use this link to sign up to the American Express Gold Card and receive 22,000 points when you spend £2,000 in the first 3 months. Step Two: Persuade your companion to also sign up to the Amex Gold Card to receive a further 22,000 points. Step Three: You’ll need to spend a further £6,000 per card once you’ve received the sign-up bonus to get to a total of 30,000 points. Whilst this may initially seem daunting I tend to spend on the card for all business expenses and it’s amazing how quickly it racks up. Alternatively, if you think you’ll struggle you could always redeem the 22,000 points for a Business-Class ticket instead – reviewed here. So now back to the review. Regular readers of this blog may have heard me mention Fifth Freedom Flights before. Essentially these provide long-haul planes on short-haul flights within Europe operated by international carriers and allow you to experience both First and Business-Class seats at a significantly reduced price (or points!). Now I found myself in Cyprus with work and knew that Emirates provided a daily service to Malta on a long-haul Boeing 777. 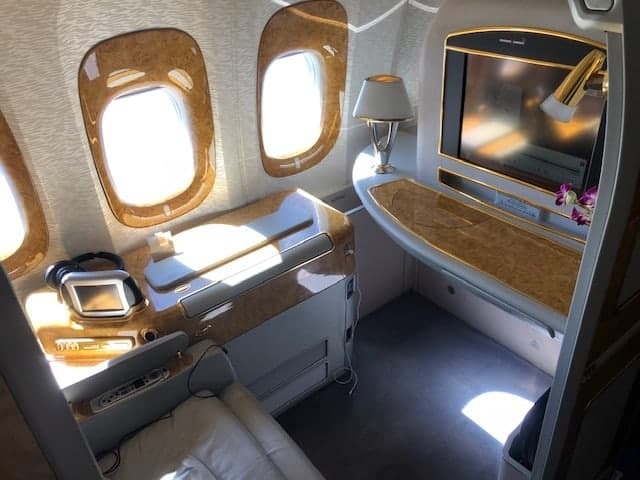 The opportunity to test out the Emirates First Class cabin was too good to miss so I decided to book myself an overnight return trip to Malta, flying out experiencing the Emirates First Class suites and back in Business Class (reviewed here). The total points required for this trip was 50,000, split 30,000 to fly Emirates First Class out to Malta and the remainder for Business Class back home. I would strongly recommend the additional 10,000 points for First if you have enough! On top of this you’ll also pay taxes which are £167 each way. The advertised First Class Emirates price for a one-way ticket is £1,248, so a huge saving. For longer-haul flights, the number of points you need increases quite significantly. London to Dubai for example in First Class is 85,000 points. So if you’re desperate to experience Emirates First Class (just like I was) I would definitely recommend a cheap flight to Cyprus, spending a couple of days there, before making your way to Malta in style! Upon booking your Emirates Airline First Class flight, you’ll be able to select your suite. You can see from the below picture that the cabin is arranged in a 1-2-1 layout. Whilst my other half was also flying with me, we decided to each go for a window seat. So she had 1A and I had the seat directly behind (2A). Once you’ve booked your Emirates Air First Class ticket, don’t miss the opportunity to also arrange your complimentary private chauffeur service which will both drive you to the airport (within 50 miles) and once you’ve arrived in your destination drop you at your chosen location. I had a hire car so only made the most of this when I arrived in Malta…. My driver was a little surprised when I asked him to drop me at the cheapest backpacker hostel in town! 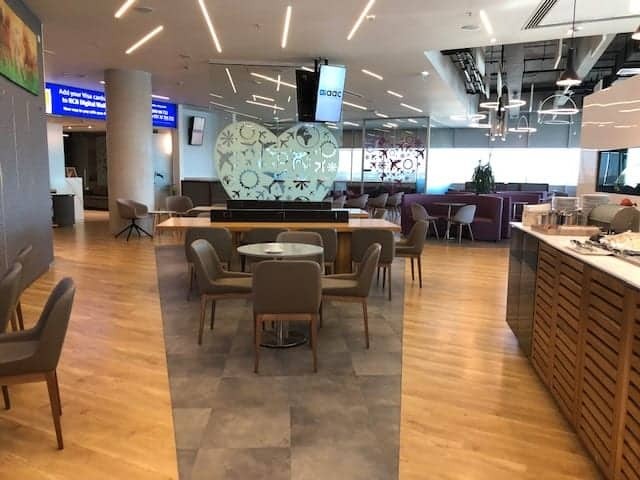 I arrived at Larnaca Airport a couple of hours before my flight, mainly to allow me to review the lounge, and when I arrived at the dedicated Emirates First Class check-in desk I was greeted by the first of many very friendly members of the Emirates staff. Check-in was extremely quiet, mainly because I’d arrived so early. Now if you’re flying out of Dubai and flying from Terminal 3, you’ll benefit from the First Class Emirates check-in area at Terminal 3 – I hope to review this at some point in the future. 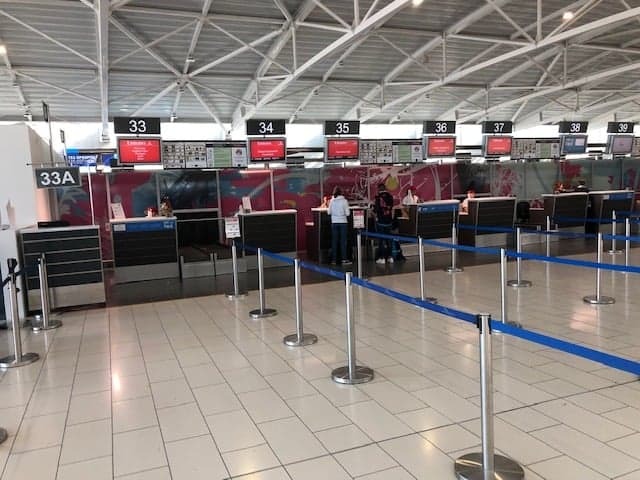 At Larnaca Airport you have access to express security which, depending on the time of day, can save an astonishing amount of time, especially during school holidays! You’ll also gain access to the third-party Aspire Aphrodite Lounge. I’m not a massive fan of Aspire Lounges however this one is most probably in the top quartile. Again, if you’re flying out of Dubai your Emirates First Class lounge access is supercharged, with a whole floor of the wing dedicated to First Class passengers. One thing I like about the Larnaca Aspire Lounge is the outdoor area, which can be a nice place to wind down before the flight (although if there’s a large number of smokers it’s not so pleasant!). The food selection is pretty limited with mini sandwiches, wraps and hot items such as spring rolls and mini pizzas. The selection of drinks is relatively standard and a million miles from the Dom Perignon you’ll be sipping on the flight. So whilst a glass or two of the house sauvignon blanc may be nice, I really wouldn’t overdo it – save room for the exquisite selection of drinks you can get from the Emirates First Class bar! Hannah and I were the only First Class passengers on the flight which essentially meant that we not only had our own suite but the whole cabin to ourselves. The downside was that they boarded us with Business Class passengers so there was a slight delay at the gate when boarding. We entered the plane through our own First Class jet bridge and were met by not one but two very friendly flight attendants. It was at that point that I knew this flight was going to be like no other I’d experienced before! 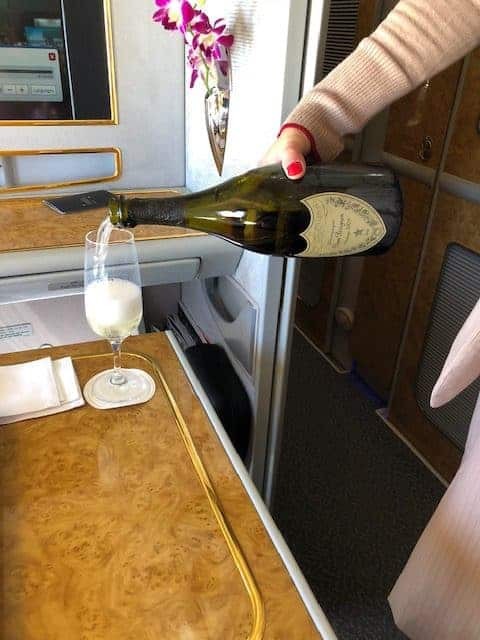 Upon arrival to our Emirates First Class suites we were offered a selection of drinks. I decided not to go big too early and went for a green tea while Hannah had a glass of the 2009 Dom Perignon which retails at about £120 per bottle! Shortly after this we were offered the signature Arabic coffee and dates. There are no overhead lockers in First but a large storage compartment adjacent to the aisle. As the flight was so quiet, the flight attendant suggested that I use the adjacent suite for my luggage (my luggage has never had it so good!). As you can see from the picture, the legroom is great and the seat, with a 23-inch width (compared to say 22 inches in BA First Class), is comfortable enough. One of the special elements of the Emirates Air First Class seat is the mini bar which flips opens at the click of a button. This is stocked with several soft drinks. The little folding mirror in front of the screen with amenities is also unique and underneath the desk is a small drawer which pulls out to provide a leather writing set. As I was on a day flight, I didn’t use the suite as a bed so cannot comment on the bedding and the comfort, but I’ve heard good things. What you may not be able to see in the pictures is that there are sliding doors to the seat. 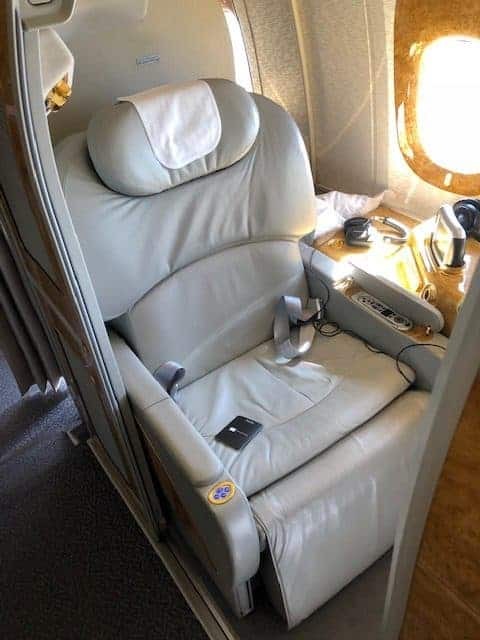 Whilst not completely private, as cabin crew can see over the top, this makes for a somewhat private space in which to relax and I’m sure it would be handy on a night flight. Charging points are somewhat limited, with only one USB socket some distance from the seat. This would be my main bugbear! Emirates is renowned for the size of their in-flight entertainment system which has over 2,500 channels. As such it’s fair to say it’s relatively easy to find something to watch – in this case it was a Colin Firth film called The Mercy (highly recommended if you like sailing). The plane I was on was slightly dated and as such I had the smaller screen of 27 inches which on the newer planes has been increased to 32 inches. The new A380 also has live television so you’ll never miss that important football match or Saturday night Strictly Come Dancing! Now one thing that caught me slightly off guard was that my phone automatically connected with the free Wi-Fi and with my provider offering Wi-Fi calling I couldn’t escape those pesky work calls ☹… Having Wi-Fi was a nice plus though. 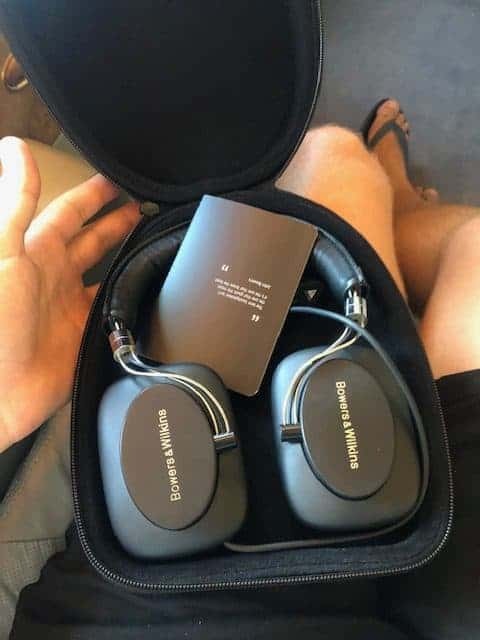 Within the suite was a brand new set of Bowers & Wilkins Active Noise Cancelling E1 headphones, which were a welcome change to the rather basic set that I use when travelling. For the sake of this First Class Emirates review (I already have a number of the BA First Class kits) I requested one of the Bulgari Amenity Kits. These are made from faux leather (in eight different designs) and come with various Bulgari and other branded products. Dom Perignon 2009 is the current house Champagne in Emirates First Class and as mentioned earlier retails at somewhere in the region of £120 per bottle. Hannah and I made the most of this throughout the flight. Emirates also has a very strong selection of wines when compared with a number of other airlines. The first in the list of white wines, Y d’Yquem 2015, retails in the region of £100 which is considerably more expensive than any white I’ve enjoyed before. 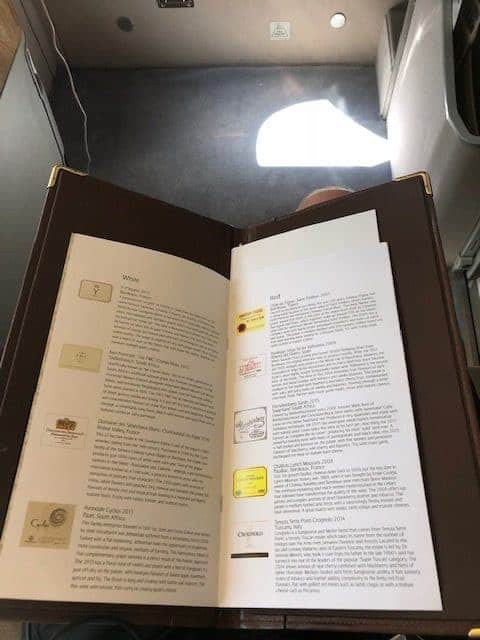 If you like your wines and do some homework beforehand, you can have a thoroughly enjoyable Emirates First Class experience just tasting the various wines! Whilst I’m not a cognac fan, I’ve heard of Hennessy Paradis before so thought I’d also give that a try…. It’s fair to say I’m not a massive fan of the £750 a bottle drink. Upon arrival at your seat you’re presented with an Emirates First Class food menu. As this was a relatively short flight we didn’t receive the full caviar experience (which I was kind of hoping for) but instead seasonal fruit for starter followed by a choice of either Beef Wellington, Cajun Chicken or Pan-fried Salmon for main followed by Chocolate Truffle Cake for dessert. Whilst each of the Emirates First Class meals were nice, they lacked the real spark that I’ve received when flying the likes of Air France. 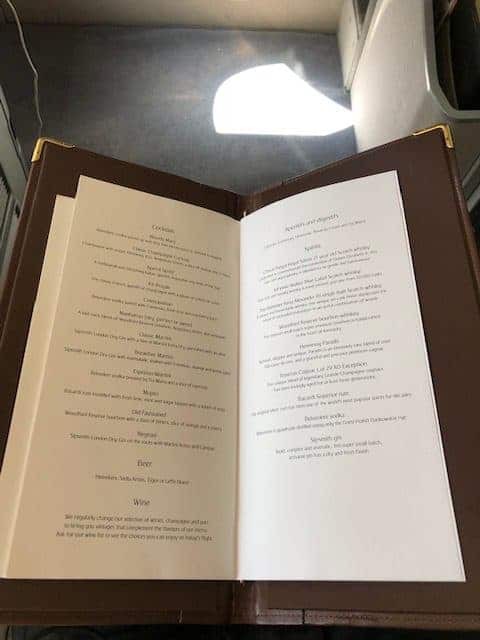 You can see a copy of the Emirates First Class menu below. Now you may have seen pictures of an Emirates First Class bar. Unfortunately this is only available on the Emirates A380 and is available to both First and Business Class passengers. As such it can get quite busy. 10 years ago, the thought of having a shower on board a plane seemed like a dream which would never come true. 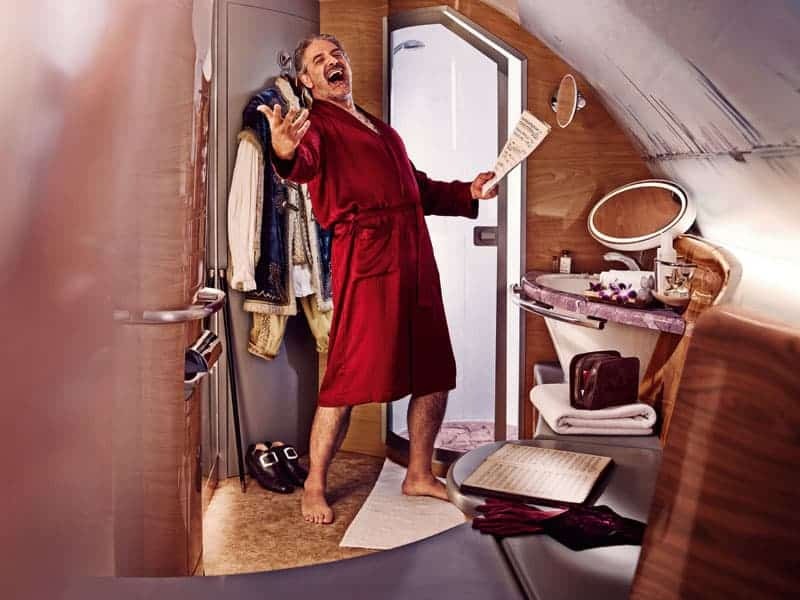 Whilst times have changed – Emirates do now provide an Emirates Airlines First Class shower on their A380 – unfortunately this dream has still not come true for me! I’ll just have to wait until next time for that Emirates First Class shower! 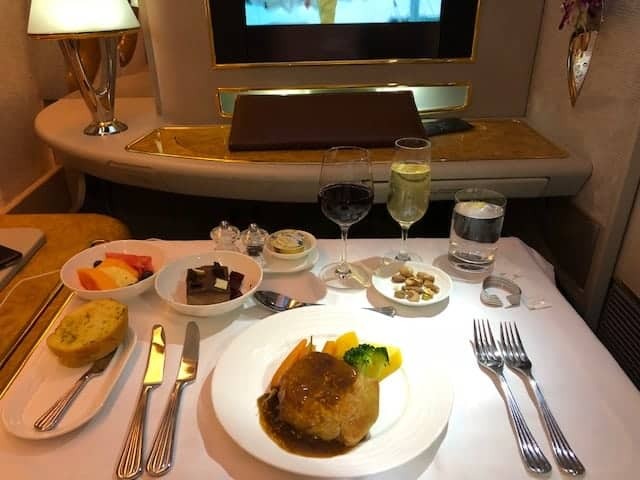 The final two areas that I missed out on: if I was paying the full Emirates First Class price I’d dearly like to have experienced the caviar service and Dubai First Class floor! That said for just 30,000 points and £167 this was truly a bargain which I believe is in reach of all by simply maximising the benefits of the American Express Gold Card. So was it worth using 30,000 air miles per person to fly Emirates First Class? Completely and utterly yes. Flying in an Emirates First Class suite was a once in a lifetime experience for an average Joe like me. 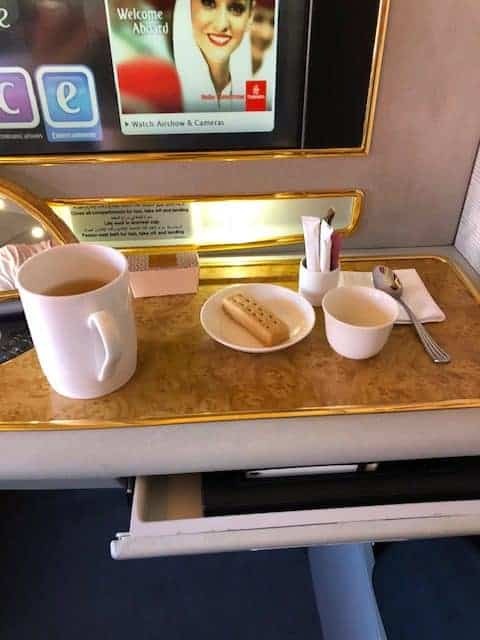 Hopefully anyone reading this Emirates First Class review has gained an insight into the incredible world of upper-tier flying and realises that it is available to almost anyone! I’ll finish this review with a couple of words of advise for anyone seeking to book an Emirates Airlines First Class flight. If you’ve only got 30,000 Skywards points (Amex reward points) and you want to experience First Class, then the Emirates flight between Larnaca and Malta is your cheapest option by far! Those with 80,000+ reward points who want to experience the full offering should look to fly from Dubai to London on the A380. With this flight you’ll experience the Dubai First Class floor as well as the full on board caviar service. Oh, and don’t forget to make the most of the Dom Perignon at £120 per bottle!! Step Three: You’ll need to spend a further £6,000 per card once you’ve received the sign-up bonus to get to a total of 30,000 points. Whilst this may initially seem daunting I tend to spend on the card for all business expenses and it’s amazing how quickly it racks up. Alternatively, if you think you’ll struggle you could always redeem the 22,000 points for a Business Class ticket instead – reviewed here. As always I hope you’ve enjoyed this Emirates First Class flight review. Please do not hesitate to get in contact if you’ve got any questions.